CONTEST EXTENDED due to a Database Crash. Deadline moved to June 15, 11:59pm GMT +8. In case your entry was lost, please join again. My apologies. Hey folks! Been plagued by hosting issues lately but I have managed to move the site successfully. Still tweaking some settings but it looks like things are going to be fine now. *crosses fingers* During this time, while I was reading all sorts of troubleshooting articles I couldn’t comprehend, pestering net-savvy friends for help, and headdesking from frustration, Kitchen Cow’s Third Anniversary actually came and went. Well, two weeks overdue it may be, but I won’t let that stop me from celebrating! 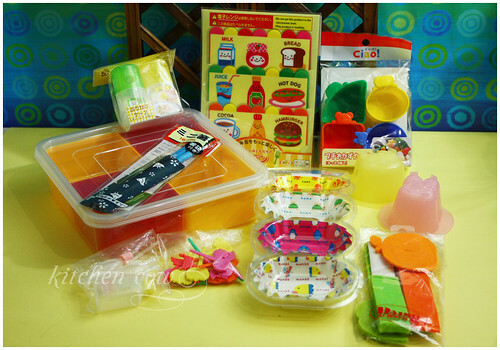 So, let me present the Kitchen Cow 3rd Anniversary Bento Giveaway! What’s in the Bento Giveaway? Well, everything in the photo! Like last year, this year’s giveaway is open to all readers, regardless of geographic location. Well, as long as your shipping address is serviced by the Post Office. ^_^;; Simply make a comment in this post, containing your answer to this question: “If you win this bento package, what will you put in it?” Each comment gets one raffle ticket. If you want to win an extra ticket, answer the question in your own blog and add a link back to this contest post. Please remember to post your blog’s URL in the comment’s section here so your points can be counted and to spread the love. This contest will run until June 8, 11:59pm Manila time (UTC/GMT +8 hours) to post your replies. Results will be out June 9. Good luck everyone! This entry was posted in admin, culinary events and tagged anniversary, bento, free, freebie, giveaway, kitchen cow, kitchencow, obento. Bookmark the permalink. Love your pictures and would love a bento kit. Brainstorming as we speak! I will use it for me! A slot for mini pancakes, maple syrup in the condiment container, sausages, a slice of cheese, and fruit for a perfect breakfast at the office. I will use the bento set for my everyday lunch. I always have my lunch packed when I go to work. I’d put all sorts of food in it, from simple omelettes to yummy dishes that my mom cook for us. (^_^)v — smiley with peace sign! I don’t have any bento gadgets at the moment…so if I win your giveaway, then I would definitely start my dream bento meals!! this would deffinatly give me an excuse to eat more of the japanese and other foods i like on a daily basis. hello i am relatively new to your site so i don’t feel like i deserve a bento giveaway. but, if i had something like that i would be motivated to cook and bake lots of food every time just to make use of it. From pastas, sandwiches, chicken dishes, vegetables, i’ll even try making sushi. after, i will share it with friends and family to make it even more special. I kid you not, I have spent the last several hours on thw web and bento. I’ve even signed up for a class at a local community college. I love the site. Great info! if i win the bento set, i would prepare a japanese-italian fusion meal for me and my husband, and we will go somewhere, probably in tagaytay, and have our anniversary picnic there. Hi there! Just looking through your site for some ideas for bento and I saw the announcement, sorry to see the database crashed, I hope everything returns to normal soon. Love the recipes on the site, and am going to try a few this week for my lunch! As for the bento competition, I think a must for compartment 1 would be some chicken teriyaki, possibly with some shredded white cabbage and some stir fried beansprouts, with plenty of sesame seeds and lemon juice on top. Compartment 2 would be for rice, with some cut-out shapes of nori, a sliced boiled egg and a little shichimi – yum-o! Compartment 3 would be for fruit – some lovely refreshing cantaloupe and honeydew melon, a couple of strawberries and a grape or 2 for good measure. Finally, compartment 4 would be for sweet treats, probably red bean mochi and a couple of little pandan crispy sticks… My mouth is watering now! See how much inspiration you’ve given me already after just an hour of browsing! Congratulations on your 3rd anniversary! Thank you for this chance to win such a great giveaway. If I were to win it, I have the perfect foursome for it: rice, barbecued pork, itlog na pula and tomatoes. I’m so glad I found your blog. I would make lunches for my little one who has a nut allergy and so I don’t trust the food in schools. And for those who joined again despite losing their entries, thank you for the forgiving attitude. *hugs* You guys are the best. Wow! Extended to June 15! I can still join! We have a terrible canteen. If you don’t believe me, I’ll gladly show you. Really. The servers are grumpy. We tried smiling, being nice, and flirting (I did! ), but nothing worked! And did I mention that the food portions are very small? They are! Most of the time, we feel like we’re asking for alms when in fact we’re paying a hefty price for such an awful food. So we bring our own baon. Friends have followed suit. We’re currently using Lock n Lock. And while Lock n Lock is useful, my wife wants something substantial but playful. Lock n Lock looks pretty boring. My wife and I have been searching high and low, and with this bento package, in no time at all, I’m pretty sure we’ll be having the same bentos you’ve been sharing all these years! So, in this bento I would put seasoned rice with peas, decorate with meat and cheese, tuck in bites and bits of veggies and fruits. Packed full of love. I’d put food in a bento. If I win I would put in the clear bento some tempura shrimp , carrot cut in flower and edamame on the mini pick and some chicken yakisoba. With he hello kitty mold I would do some strawberries jelly with whipecream. with the bento cup I could put some snack in them. If I won, I’d use the bento and supplies for my school lunch. I neveer eat at school, mainly because I don’t like the lunch provided. I usually end up buying some candy or chips. But with these I would be able to bring my own healthy, tasty lunch. Knowing me, though, I’d probably stop making my own lunches, and end up using it for my mom. she goes to work at night and wants to eat healthier, so she would enjoy it a lot. i hope this entry still makes it in time. again please please include me… but if you can’t it’s ok.
thnx! tc n hope you’re having a great day. I really really hope im in time!! If I won the prize I would put all my school lunches in the bento boxes! I’m trying to turn over a new leaf for next year and make my life more organized and this would be a great start!